Letter from LP to Dr. Vand RE: in response to Dr. Vand's letter of inquiry, LP is sorry to write that he does not know of any openings in the crystal-structure field to recommend for him. Writes about his own work in collagen. [Letter from Dr. Vand to LP December 17, 1953] [Filed under LP Correspondence: Box #427, Folder #13]. 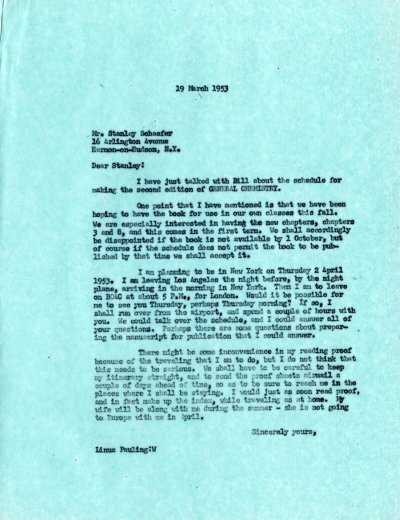 Letter from LP to the Committee on Public Ceremonies RE: Will be pleased to present at the Charter Day Exercises on March 20, 1953, but would like a ticket sent for AHP. [Filed under LP Science: 14.011, Folder 11.2].